Arya and Ned stand in front of some of the Stark and Lannister retainers, including Jory Cassel and Ser Illyn Payne. Linked from Wikia © HBO. Ned Stark, Robb Stark, and other lords are almost never without their men. Men such as Ser Illyn Payne and Jory Cassel, the captain of Ned’s household guard at Winterfell, served kings and nobles and lived in their households. Jory Cassel and other men in Ned’s retinue accompany Ned everywhere. Ned’s retinue is with him when he executes Will the deserter from the Night’s Watch. Jory is with Ned when the Starks find the direwolf puppies. Jory is also with Ned, fatally so, when Jaime Lannister’s men ambush Ned outside of Little Finger’s brothel. George RR Martin describes these men as retainers and their real-life counterparts were an essential part of noble life. In the late Middle Ages, nobles (the upper aristocracy, such as dukes and earls) presided over large bodies of men they paid or retained on a contractual or lifelong basis. Collectively, they formed a private army for the lord. To really get a sense of the difference between our world and the late Middle Ages, consider how our relationships and ideas about service have changed. Today, the idea of service or being a servant to somebody typically has a negative connotation. Many people feel it would be beneath their dignity to wait on somebody: often there is little prestige in being a servant. This was not always the case. Not only that, the word servant had a dramatically different meaning six hundred years ago. A few members of Ned’s retinue at Will’s execution. See the men in helmets and Ser Rodrik Cassel, on the left in the foreground. © HBO. Being in service to a lord could be incredibly prestigious. Today, I suspect few of us feel a lot of prestige-by-association from working for a famous company. In the Middle Ages, your importance rose and fell with that of the lord whom you served. The only close modern-day equivalent might be the sense of importance and perhaps even social power we might receive by going to a world-famous university or working for a prestigious law firm or storied consulting firm. Ser Rodrik Cassel. Linked via Wikia, © HBO. If you translate Game of Thrones into medieval terms, Jory would be a member of the gentry or lower aristocracy. His uncle, Ser Rodrik Cassel, is Winterfell’s master at arms, but the fact he is a “ser” implies a knight. Even Ser Baristan Selmy, former Lord Commander of the Kingsgaurd, is from minor noble family (House Selmy). The Duke of Buckingham holds a washbasin for Henry VIII to wash his hands in from The Tudors. Linked from The Tudors Wiki, © Showtime. Retainers fell into two groups: men who lived at the household and men outside of it. Contemporaries assumed retainers inside the household had a much more intimate, loyal relationship to the lord than those outside the household. The term household referred to the lord, his wife and children, and their servants who lived in the same castle or estate together. The household itself had two divisions: the upper household and the lower household. While the lower household prepared food, cleaned and did other everyday toil, the upper household ostensibly spent their time on administration, errands, and assisting the lord in his chamber. In practice, however, they probably spent most of their time keeping the lord company – going hunting and playing dice with him.2. For anyone that watches Downton Abbey, which is set during the post-World War I, death-march period of the Great Household, you can see the distinction between the upper and lower household as well as lingering vestiges of medieval Great Household. The underhanded Barrow Nanny West ©PBS, linked via Wikia. The first episode of Season 4, shows a conflict between the scheming underbutler Thomas Barrow and the newly hired Nanny West. As somebody who cares for the family’s intimate needs, Nanny West perceives herself as a member of the upper household, so she tries to give Barrow orders. Barrow retaliates by telling Cora that Nanny West is neglecting the children. In contrast with the great household in Downton Abbey, in medieval English great household, the only female positions were laundresses and the women who attended to the lady of the house in her chamber. Many Richard III historians refer to an episode in which Richard’s brother Clarence hid Anne Neville as a kitchen maid to prevent Richard from marrying her. What’s often omitted, but perhaps implied to the chronicler’s contemporaries, is that in all likelihood, disguising Anne probably meant dressing her as a boy. The purpose of the lord’s household was likely primarily protection and military service. Household men, even the ones cooking and cleaning, were chosen primarily for their youth, height, strength, and potential as warriors.3 Contemporaries saw the great households’ servants as having a military function. Sir Thomas More characterized these men as being the nation’s army “in them standeth the chief defence of England.”4 Such large numbers of men certainly would protect the noble family from attack and “castle” invasions. Robb Stark and his men at the Twins. Robb’s bannermen are his retinue. © HBO, linked via Wikia. Still, households full of young men with the potential to be great warriors, skilled at arms, and often too much time on their hands, could lead to trouble. Noble households were noted for quarrelsome young men who often resorted to violence to settle disputes. When you have the equivalent of a small army living in your house, it is essential to keep it under control. George, Duke of Clarence, Edward IV’s brother, faced just such an issue when he came to have his own household in his teens. Warwick helped Clarence to create a set of household ordinances. These ordinances forbade swearing among other things. When you had a large body of skilled fighters living under your roof, discipline was essential. Some historians attribute the vendettas that ignited the Wars of the Roses to violence and illegal feuds between retainers. For example, during the 1450s, the Percy retainers would get into physical fights with the Neville retainers and terrorize each other’s tenants. Medieval retainers didn’t necessarily “work” for their lords – at least not in the modern sense of the word. Unlike many jobs today, which are simply exchanges of labor for money, retainers did not always receive money for their services. While money and spoils from battle typically helped keep men loyal and were required in most relationships, equally important was the noble’s “good lordship” to the retained man. This meant protection from onerous royal prosecution and a powerful advocate in their disputes. Retainers who did not live in the household often, but not always, had contracts with the noble, known as indentures. (As an aside for all the paper fanatics out there, these indentures were written in triplicate on a long piece of parchment with perforations (or indents) for tearing them apart. The lord, retainer, and presumably courts each received a copy.) Nobles didn’t need contracts for their household men; their loyalty was assumed. Even Ser Illyn Payne, the royal executioner Ned once described as a “butcher,” would have been a part of the lower aristocracy. Linked via Wikia, © HBO. 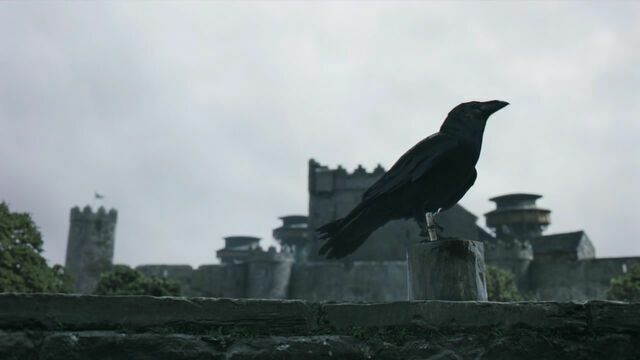 George RR Martin includes concepts such as the lord’s retinue subtly in Game of Thrones. In Game of Thrones, you catch glimpses and allusions to this great household environment. Sansa and Arya are looked after by a woman, Septa Mordane. You see relatively few women at Winterfell other than those caring for the children. When you compare these medieval (or medieval-esque) worlds against our twenty-first century world, even the psychology of it seems remote and almost otherworldly. The movies typically depict the great medieval household as having roughly equal numbers of men and women. In reality, this would not be the case. The household of the medieval lord might have had more in common with a barracks of troops, albeit much better dressed and much less disciplined, than either its Disney medieval fairy tale depiction or the cool and orderly twentieth century successor. In sixteenth century England, by Elizabeth I’s time, few great houses still had mobs of retained men. Some certainly still did, but increasingly they were becoming an anachronism. Nobles wanted men with administrative skills, sons of mercers and merchants. As the need to crenelate buildings declined, so too did the need to have households filled with able bodied warriors. Yes, even into the seventeenth century, some nobles such as the Earl of Northampton, felt obliged to take gentry sons into their households6. But, increasingly retainers became a product of a by-gone, blood-torn England as England moved from being run by a warrior caste to a country run by administrators. This was super-interesting. Have been enjoying the new season of Downton Abbey and have been thinking of it in relation to GoT. Although really, I compare most everything to GoT. Episodes: Season 1, Episode 1 “Winter is Coming,” Season 1, Episode 7 “You Win or You Die,” Season 2, Episode 6 “The Old Gods and the New” If Robert Baratheon is an older Edward IV, does that make the man Robert likened to a brother, Ned Stark, an incarnation of Edward IV’s brother Richard? In some ways, it does. However, there are major differences and Richard III was not the only historic person George RR Martin looked to when creating Ned….